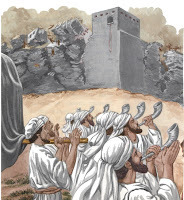 Many people may be aware of the Sunday School story regarding the Wall of Jericho in the Bible. 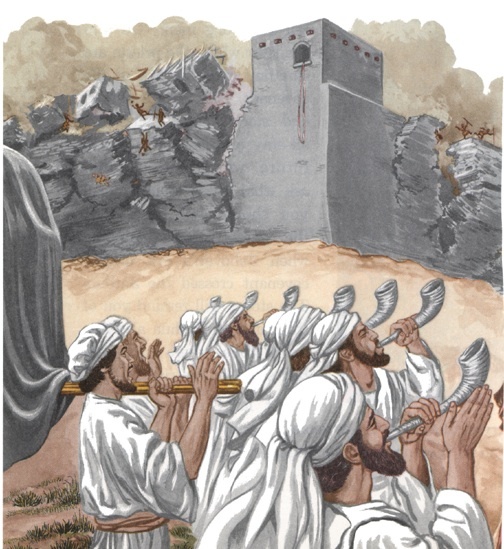 In this story, seven priests blew 7 trumpets of rams' horns resulting in the collapse of the wall of Jericho (Joshua 6:4-5) allowing the Israelites to conquer the city. "4: And seven priests shall bear before the ark seven trumpets of rams' horns: and the seventh day ye shall compass the city seven times, and the priests shall blow with the trumpets. 5: And it shall come to pass, that when they make a long blast with the ram's horn, and when ye hear the sound of the trumpet, all the people shall shout with a great shout; and the wall of the city shall fall down flat, and the people shall ascend up every man straight before him." Now... from an ENT standpoint, I can imagine the mayhem this weaponized horn sound must have caused not only to the wall of Jericho, but also to the surrounding soldiers and people. Back than, city walls were constructed of brick and mud. It is entirely possible that a loud enough sound can certainly cause the collapse of this wall, but it would have to be very loud... at least 180dB (decibels) loud. Just how loud is this sound? Well, a motorcycle is 100dB; a jet engine is 140dB. From a human ear standpoint, ear pain starts at 125dB. Permanent hearing loss due to ear tissue death occurs at 180dB... but before ear tissue death occurs, the eardrums will rupture at 160db. Even if the Israelites wore ear plugs and ear muffs (like airplane workers do), it only decreases the sound intensity by 15-45dB. So, the rams' horn sound blast at 180dB would still result in the Israelite soldiers being exposed to 140dB of sound with its attendant ear pain and temporary threshold shift (temporary hearing loss). So... though not expressly reported in the Bible, I'm sure not only did God supply the device causing the fall of Jericho's walls... but also appropriate ear & hearing protection for Joshua and his army. In fact... even if the walls did not fall, its inhabitants certainly would be deaf from ruptured eardrums and hearing nerve death. And if Jericho's army is unable to talk and hear each other, its fighting effectiveness would be pretty much severely compromised. Of note... the United States military utilizes weaponized acoustic devices that produce only 155dB. Lung rupture and presumably embolism due to air blast occur at 200 decibels which can lead to death. If you want to read more about acoustic weapons, click here which will probably provide more info than you ever wanted on this subject. Of note, I can't take full credit for the idea of this blog post which is based on an episode on NPR Radiolab. The NPR Radiolab episode purely focused on the acoustic physics whereas I've taken the extra step of how it can cause health problems.